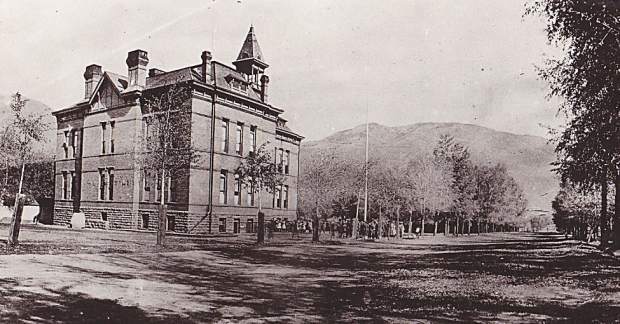 The Aspen School District built its choice property, the Washington School, during the late 1880s for $430,000 in today’s dollars. Aspen’s school district compiled a book that covered just about anything you would want to know on the first day of school, 1892. The Aspen Times printed the 100-page guide which paints an entertaining picture of how school has changed, and remained the same. The district spent $982,000 in today’s dollars, about half for teacher’s salaries. Teachers earned $80 a month, about the same as janitors. When absent, a teacher paid the substitute a minimum of $2.50. In those days, the district did not include areas outside town, but a student from out of the district could be admitted if space existed. But they paid $0.50 tuition per week, $11.90 in today’s dollars. The high school course of study differed substantially from that of today. Ninth graders endured a heavy dose of the classics, with Latin and Greek history. Tenth graders studied Caesar, and juniors delved into Virgil. Seniors tackled Cicero, German and Latin composition. As today, the school year extended 182 days. The book listed each teacher who had worked for the district since 1881. All but two of 147 names indicated unmarried women. In 1892, 23 teachers taught 1,165 students enrolled in 12 grades. Although the large enrollment had more than doubled since 1888, the number of high school graduates did not keep pace. The class of 1889 graduated six seniors, including one young man. The class of 1891 graduated nine seniors, including three young men. Finances, rules and statistics provide insight into a school district. But perhaps holidays most closely reflect the values of a school community. The Aspen school district held no classes on Arbor Day and election day. Perhaps it’s time, as they say in education, to get back to basics: trees and votes.